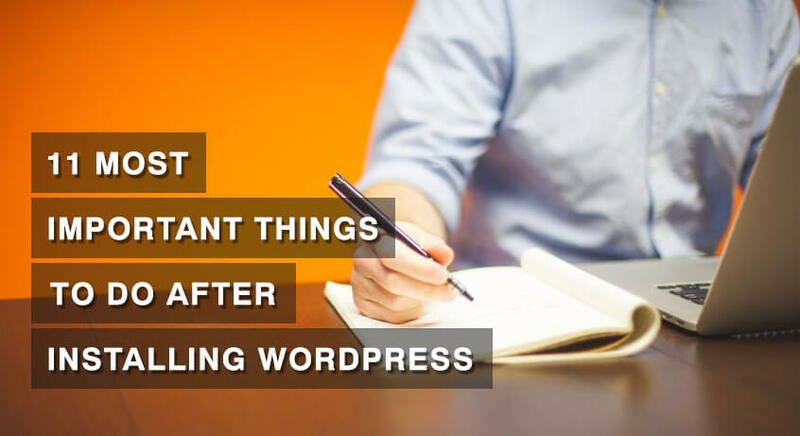 WordPress is the best platform if you want to create a magazine style website. WordPress was made for story telling. Many popular news websites like Variety, BBC America, Quartz, TechCrunch, Engadget, CNN, Forbes, Reuters, The New York Times and others are created on WordPress. 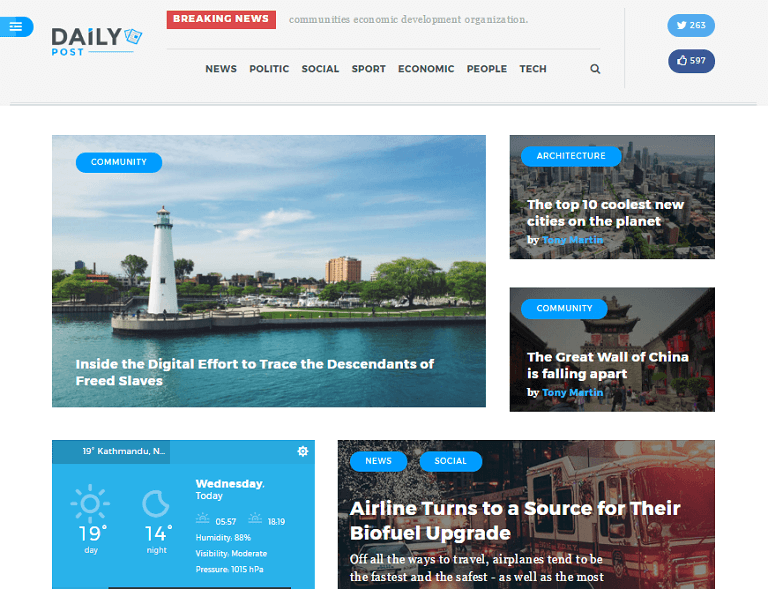 If you want to create a news website, blog, portals, gossip website or anything with lots of content, then you are at the right place.Here are the best Magazine WordPress themes that will help you organize content efficiently. All the themes included here are SEO ready, responsive, well-coded, speed optimized and highly customizable. 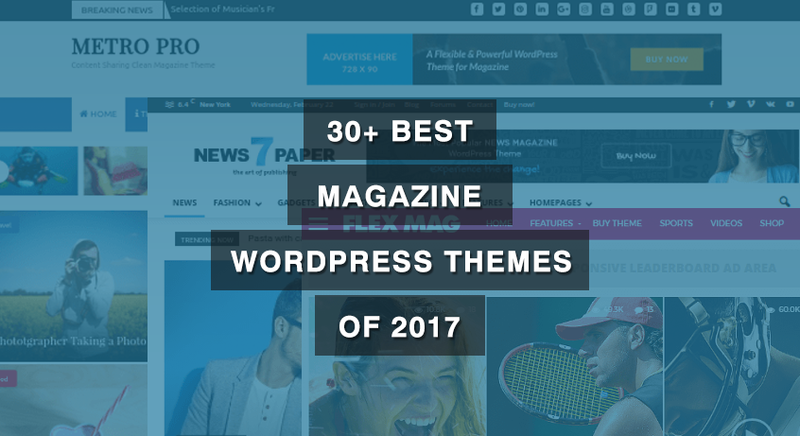 But, before you jump to the list of best magazine WordPress theme, you should read how to choose the best WordPress theme and difference between free and premium themes so that you get what you are looking for. Are you planning to write a lot in your blog/website? Then, you will need to display them on your website in such a way that all of your content are reachable by your visitors. Metro Magazine Pro is a content and user interface focused magazine style WordPress theme that will help you organize your content in an easy way. That too, with an attractive design. So, install Metro Magazine Pro and focus on developing content! 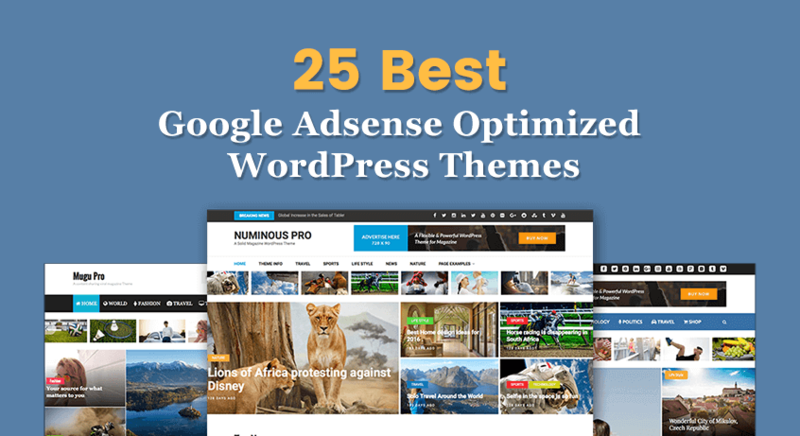 The magazine theme is Adsense optimized (so you can easily manage your Google Adsense ads) and has inbuilt Ad-Blocker detector that will help you maximize your Adsense earning. 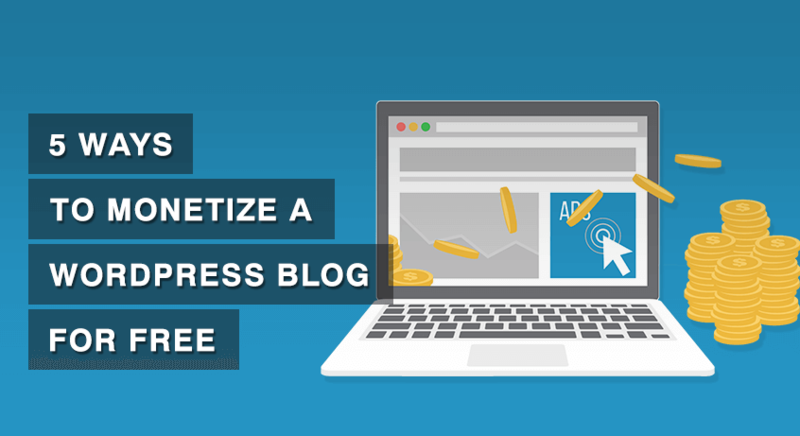 This theme meets all the requirement for any type of blogger who wants to earn money and become the authority in their niche for a long time. 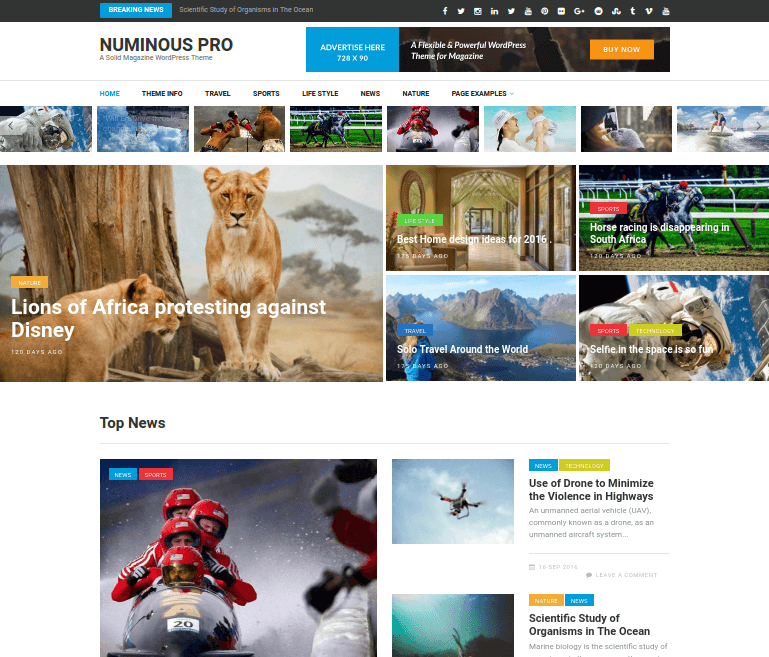 Numinous Pro is a magazine based WordPress theme suitable for people who have a lot to tell or want to create a news website. Establishing your website and making it popular is very hard these days because of the competition, so how do you tell your visitors that you are different? By writing a lot of content and organizing them on your website using categories and tags. 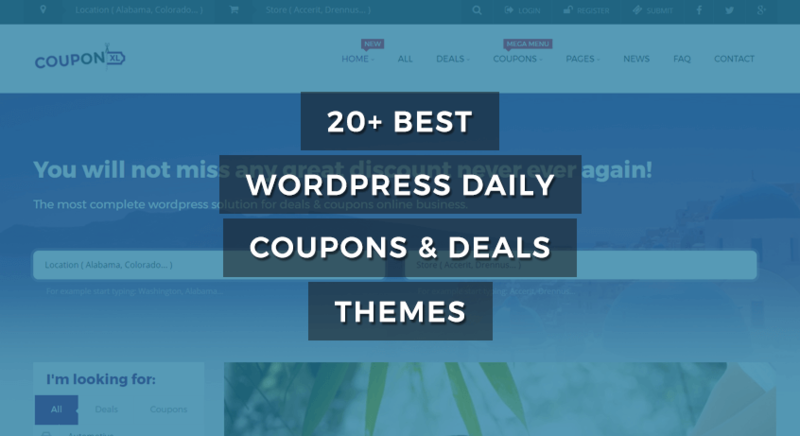 When you have a lot of categories, you will need a theme that can handle it. So, why start with a simple theme when you know you are going big? Therefore, use Numinous Pro. Numinous Pro will not only help you organize your content in magazine style but also maximize your earnings from your blog. Inbuilt Ad-Blocker detector and inbuilt Ad sections will help you make money using PPC ads like Google Adsense. If you want to sell your services or ebooks, you can do that as well (Numinous Pro is compatible with WooCommerce plugin). This powerful theme also has a free version if you want to try it (free version does not have all the features of the pro version). Attractive sharing buttons and magazine layout of Mugu Pro is something that will help you become a popular blogger. The theme also can be used to sell your services and products using the WooCommerce plugin without any fuss. If your visitors do not speak English, you can even localize your website because Mugu Pro is fully compatible with multi-language plugins like WPML and Polylang. 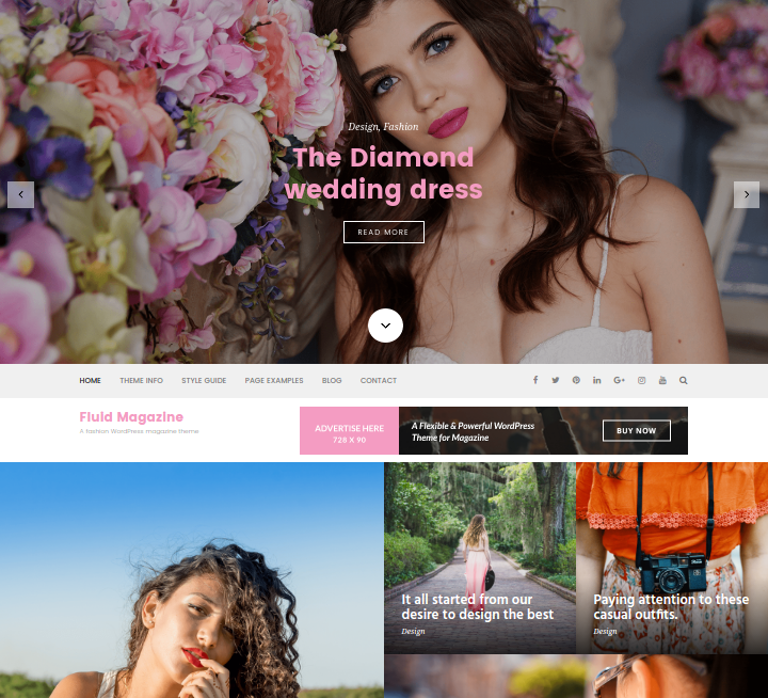 Fluid Magazine is an advanced and sophisticated, yet easy to use and customize, magazine-style WordPress theme. Extra is powered by the Divi Builder, an insanely fast and incredibly intuitive front end editor like nothing you have seen before. You can easily create a magazine website by drag-and-drop method. Featuring a crisp, modern design, TheStyle will give your blog that unique visual impact you have been looking for. With its unique jQuery-enhanced fluid width design, your posts always get displayed in a way that is best suited for your visitor's resolution. It comes with 12 custom widgets already installed. It is WooCommerce ready theme and includes a built-in review system. It includes a list of 350+ scalable vector icons as replacement to image icons. Newspaper is an AdSense friendly magazine WordPress theme. 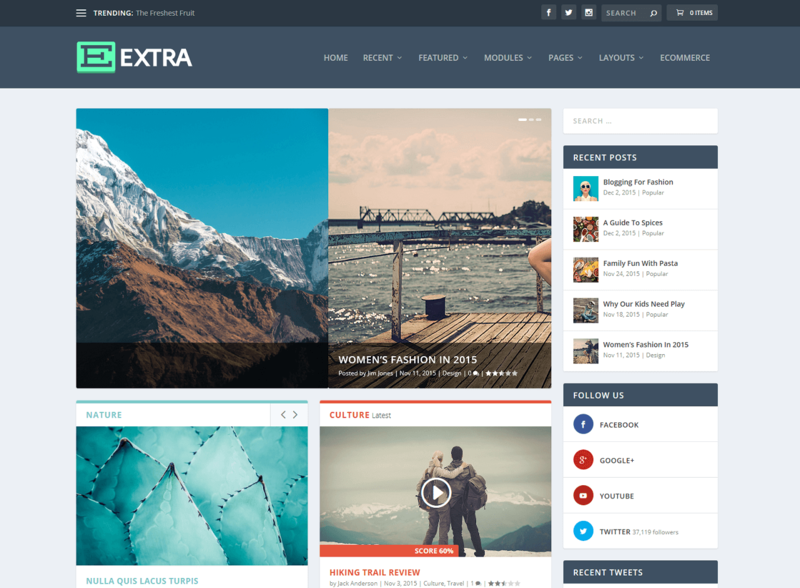 This theme is suitable for news, content marketing, magazine, and review websites. The theme comes with clean design which gives your site professional look. The responsive design makes your adaptive both in desktop and mobile screen. The theme has YouTube embedding with featured rating system. Newspaper is integrated with bbPress forum, BuddyPress social network and WooCommerce. 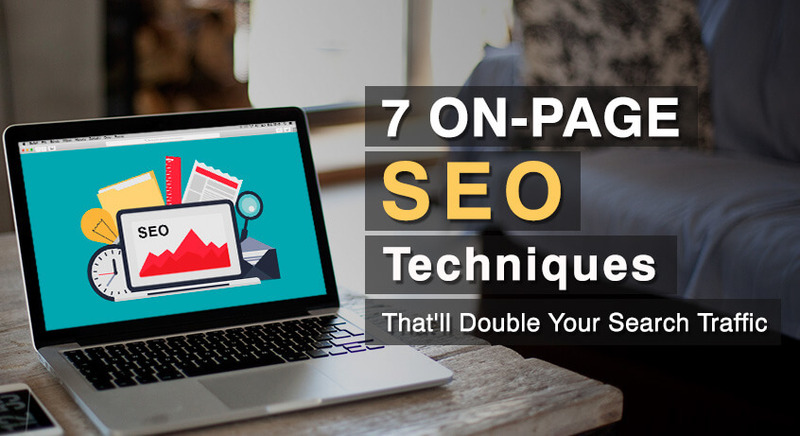 It follows best SEO practices to make your site equally rank in all search engines. The theme brings fast, light and stunning Mobile theme. You can featured section highlights recent and trending posts on your website. 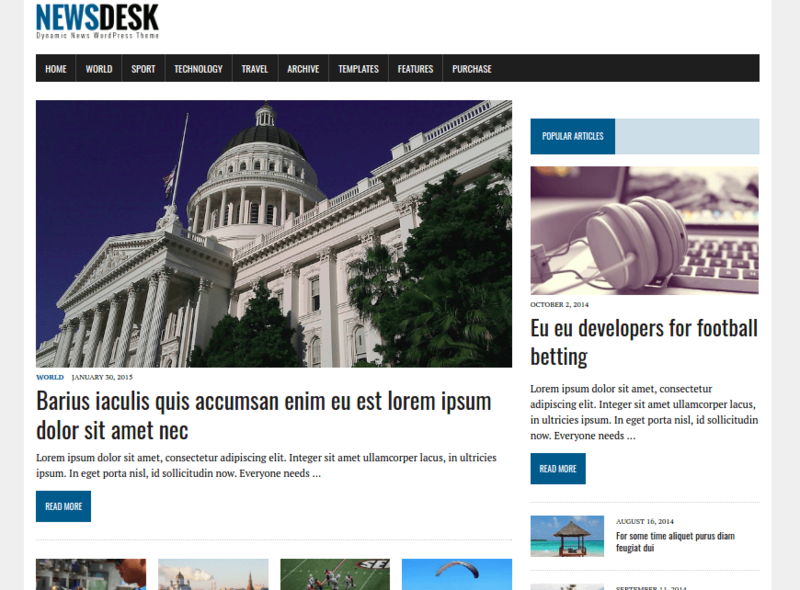 MH Newsdesk is a stylish magazine WordPress theme. The theme is suitable for news, magazines, content sharing blogs/websites. MH Newsdesk comes with dynamic news feed with powerful and extendable features. Well, the theme has built-in support of advertising (AdSense). The theme is built for faster page load and SEO friendly designs. This makes your contents easy to rank in search engine. 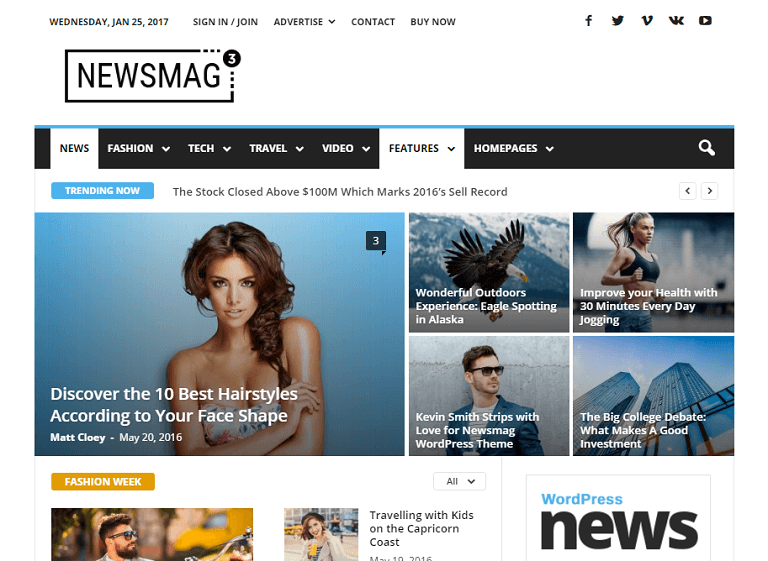 NewsMag is attractive, magazine WordPress theme. It offers great design for news, magazine, article publisher’s website. The legible fonts and elegant typography takes the visitors experience to next level. Support of high resolution (retina ready) images, makes your site great on every screen sizes. The theme provides a responsive design that is highly adaptive. This design that looks great on every device platform (mobile to desktop). It great to have color schemes, and 600+ Google Font that matches your branding. Also, the inbuilt SEO support improve the ranking in search engine. Additionally, NewsMag comes with a post slider to display your latest contents. Whereas, News ticker will highlight the breaking news and social media integration lets your readers to share your contents. Newsmag is great choice for those who wants to run magazine or news site. Daynight is a great modern magazine theme for WordPress site. This theme is bundled with features like good spacing, clean typography which is crucial for news or magazine theme. 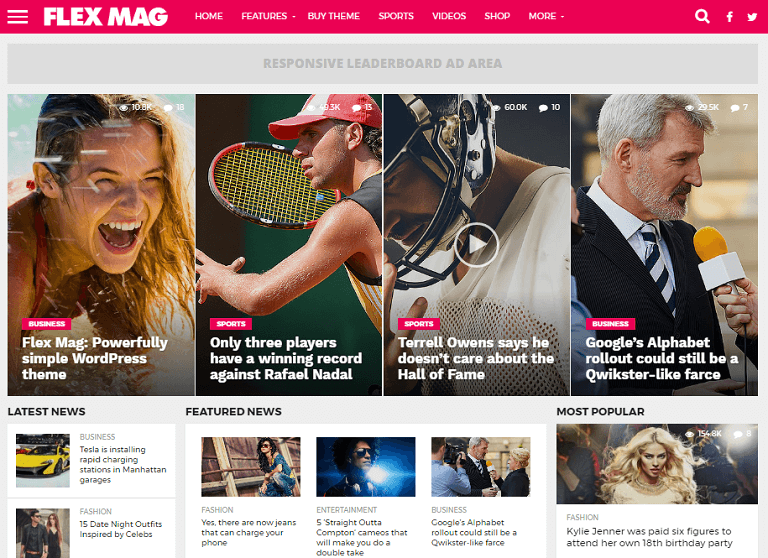 The theme is a perfect WordPress theme to build a professional magazine and news website. But, you can also personalize this theme as a blog. Daynight has well placement for Google AdSense. This magazine theme is designed based on latest SEO practices. 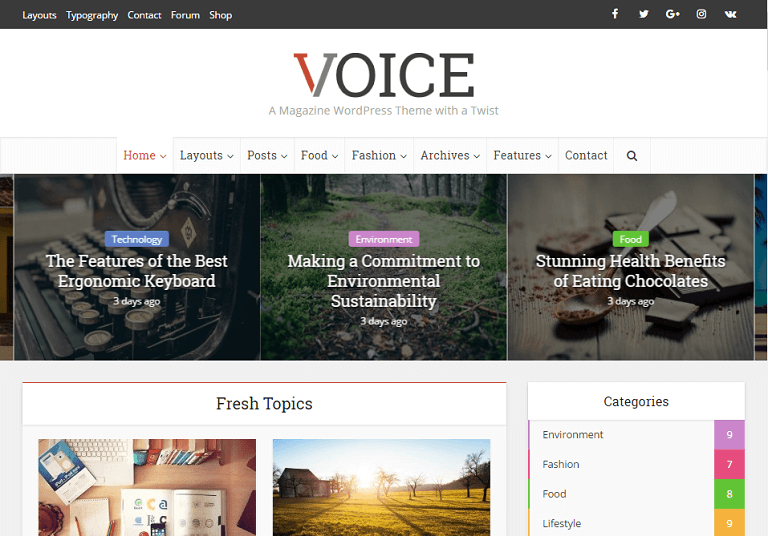 Voice is a beautiful, clean magazine WordPress theme. The theme is dedicated to online publishers also suitable for any news and magazine sites. The theme comes with several header layouts with navigation. It give you enough space for Ads and Banners. It includes 7 main layouts for Post listings and 3 featured area posts. It supports eCommerce features with the help of WooCommerce integration. Also, the bbPress helps you to build powerful community or social network websites. Voice combines user-friendly content creation tools with elegant and functional design. The theme is highly customizable with advanced theme options panel that allows you to quickly and easily create a style to suit your needs. You can change Google fonts and colors scheme within click of button. The theme comes with responsive design and great typography. It focus on readability so your visitors feel comfortable to view the contents. The theme customizer gives option to change the style of your page with ease. 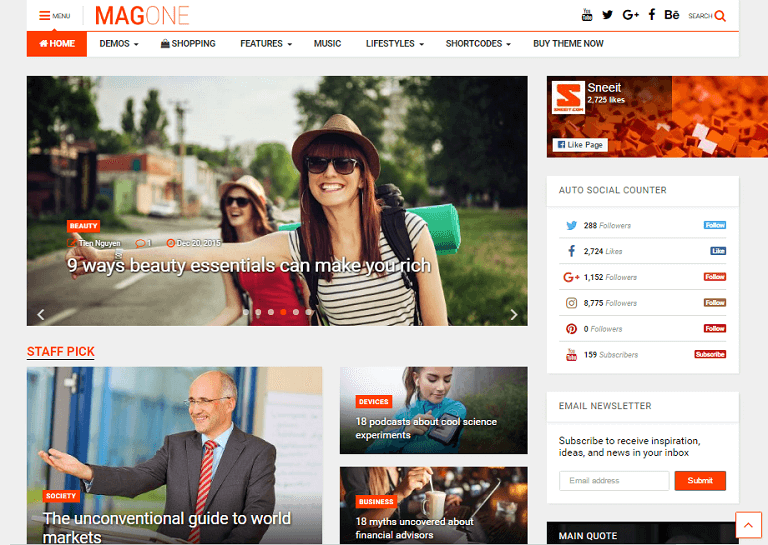 Smartmag is a yet another magazine WordPress theme suitable for online review/magazines, newspapers, or blog. 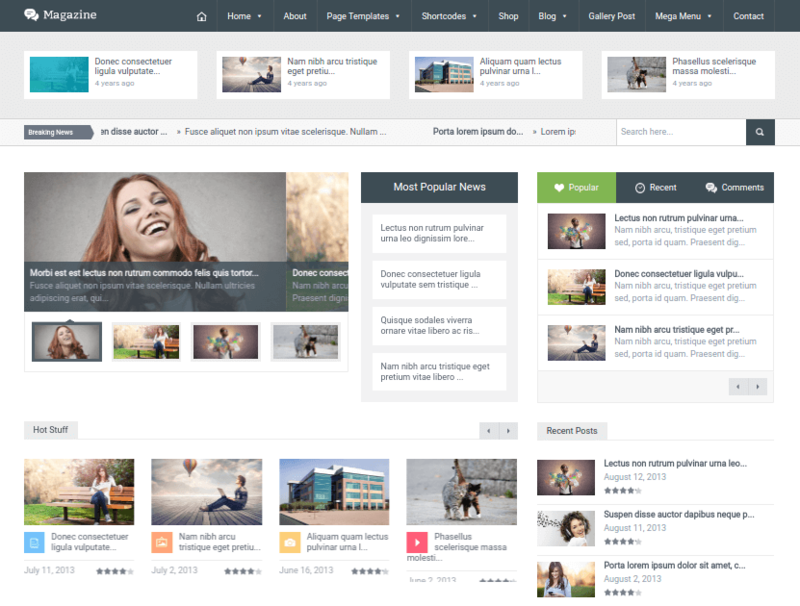 The theme is packed with slider revolution plugin. Similarly, it is integrated with review system with ratings in a clean layout. 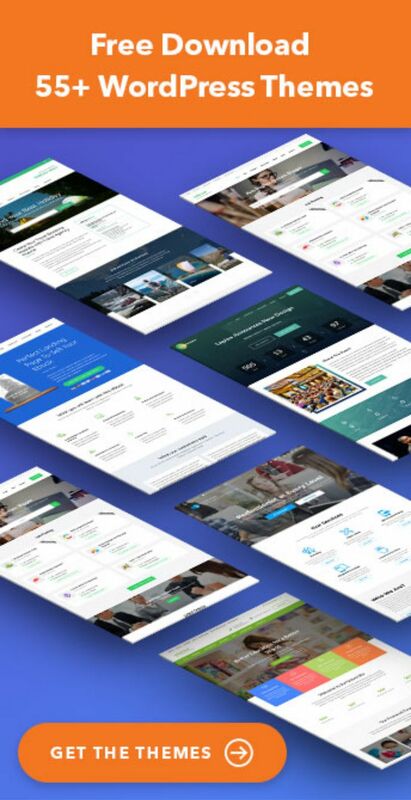 The drag and drop page builder makes easy to create unique and creative homepages. The support for rich snippets will increase ranking boost in search engines. 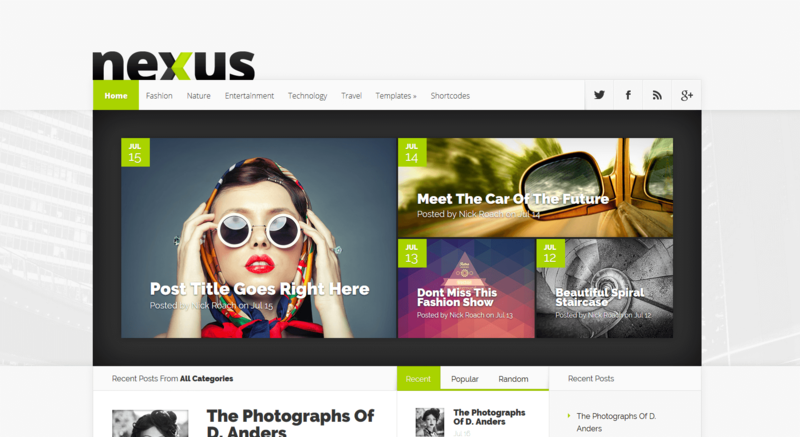 Flex Mag is a professional looking magazine WordPress theme. 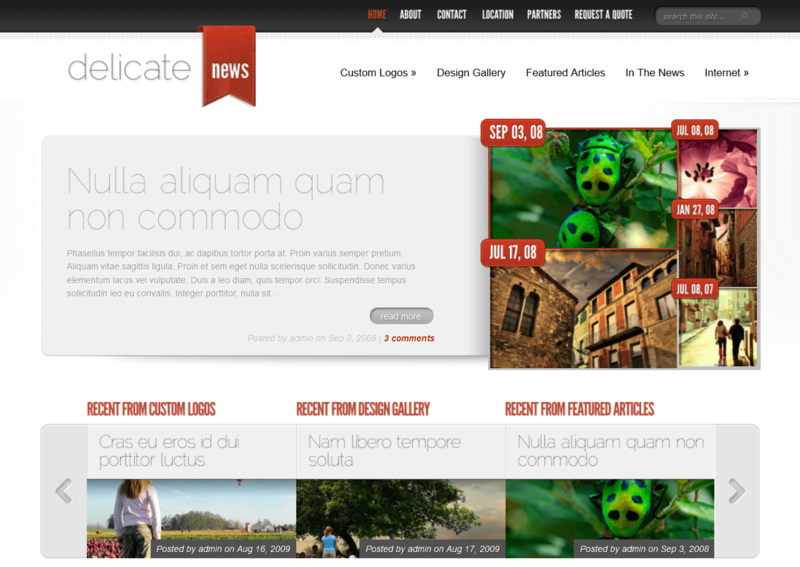 It is packs the retina friendly news and magazine theme. It comes with 8 post layouts, 4 ready made templates (sports, technology, entertainment and fashion). Not only this, you can even create your own custom layout with unlimited color schemes that match your brand. Well, it has auto-loading post features which loads your articles instantly. So, your reader can continue reading your posts just by scrolling down the page. Similarly, Flex Mag has simple yet powerful features. It has Ad space to monetize your site with AdSense or similar ad network. 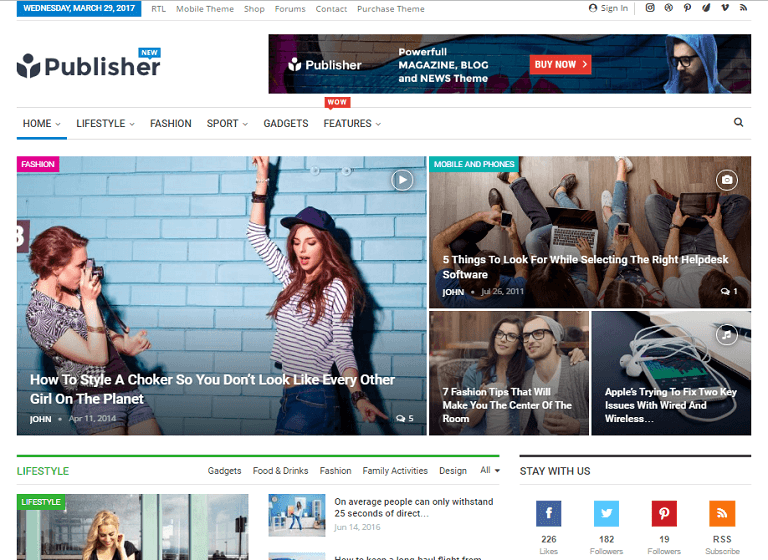 Publisher is a clean, magazine WordPress theme. It creates news website, online magazine, personal blog. The website has 10 demo page, 170 pre made homepage, 2 or 3 column layouts. It create outstanding websites with it's attention seeking, easy to use interface. The theme provides unlimited customization options, custom layouts and headers for your websites. Publisher integrate with WPML which to translate website to other language. This theme also has RTL (Right to Left) language support. 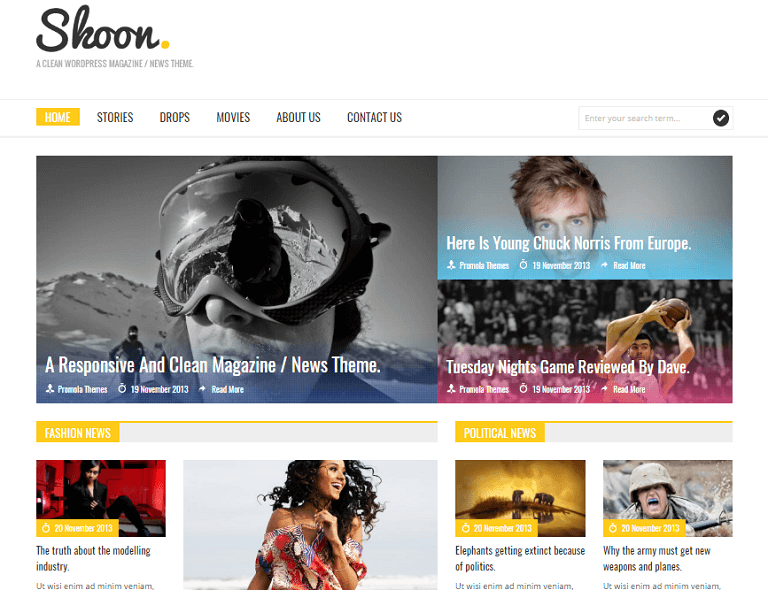 Skoon is a magazine WordPress theme. It is also well suited for review, newspapers, or viral blogs. The theme has 10 colors schemes for different sections. It has It has a responsive layout and full width page template. It comes with video widgets (Vimeo, Youtube and other supported). Similarly, the theme comes with social network widget, Google Maps and different post format (video, audio, gallery). Not only this, the theme is ready for translations. 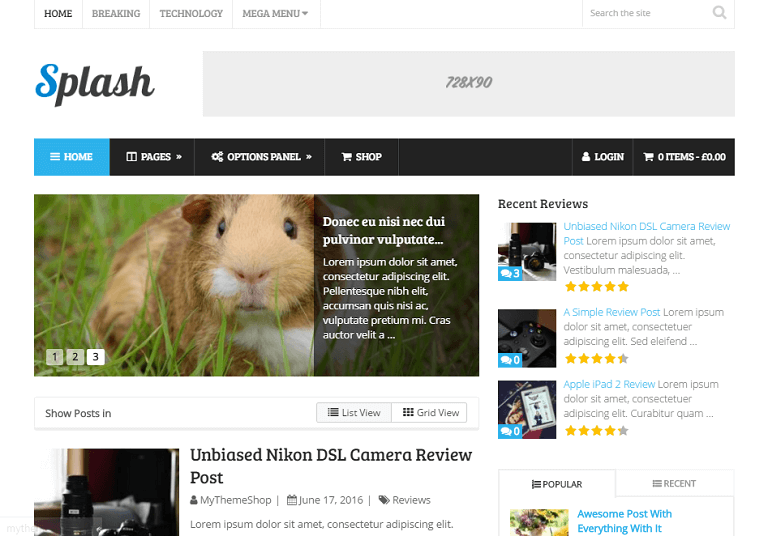 Daily Post is another great WordPress magazine theme. It is ideal for magazine, news, viral content generating blog/websites. The theme has grid based layout for homepage and multiple layouts for featured post. Also, this theme has news ticker to highlight your breaking news. Similarly, the theme allows you add news submission form and weather widgets. Daily Post includes features like shortcodes, visual composer (page builder), social media integration. In addition, the theme comes with a popular post sidebar (sticky), and infinite page scroll. 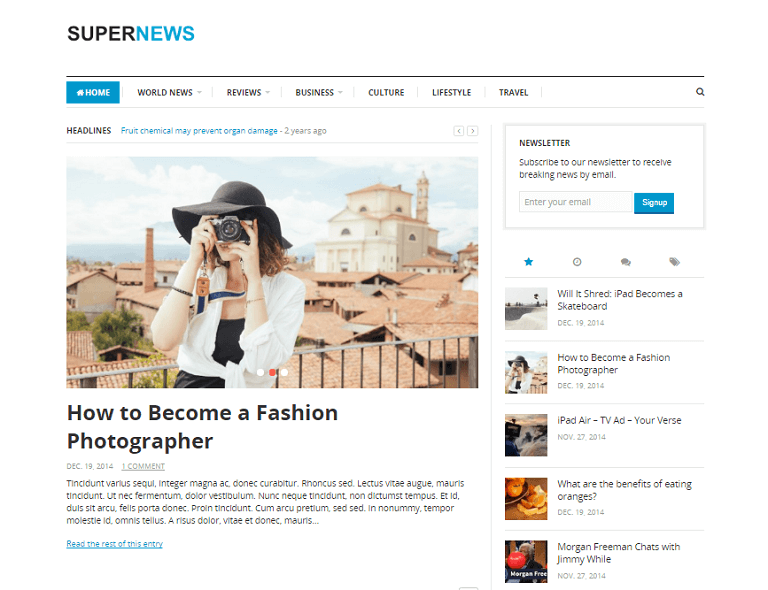 SuperNews is a superb magazine WordPress theme. It gives the modern look in the news, magazine, blog, review websites. The theme has ad management system supporting various Ads platform. You can add custom ads in various sections and sidebars. You can use font awesome, Google fonts, color scheme to add user experience. SuperNews follows best SEO practices for website traffic growth. 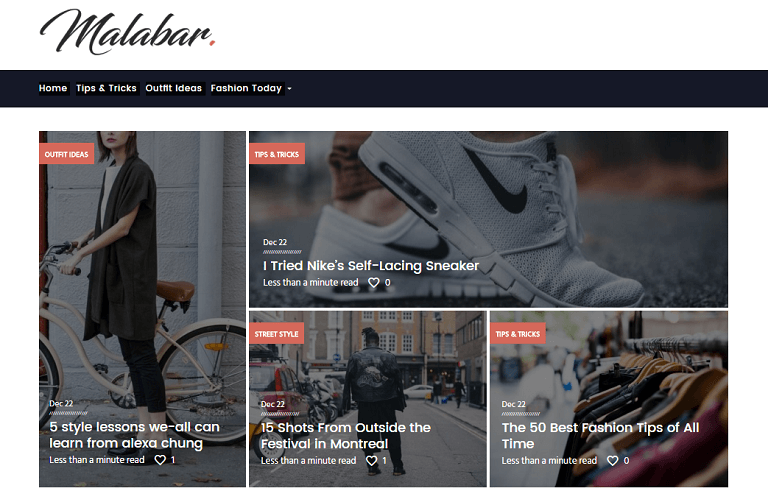 Subha is a clean, yet highly responsive WordPress magazine and news theme. The theme can be used for website like online sports/fashion newspaper, travel blog. 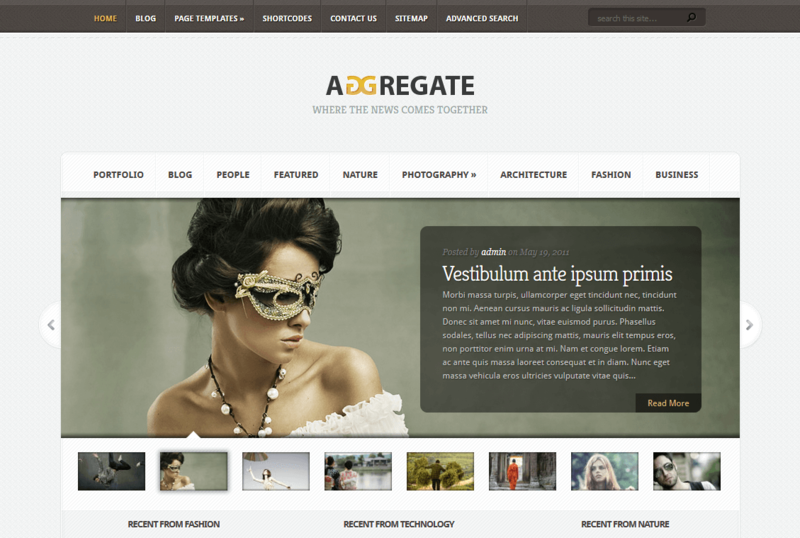 The theme has 2 column layout, 6 types - mega menus, breadcrumbs and pagination option. It has intuitive yet powerful tools that help you design with ease. The theme focuses in professional quality so it is polished with bold and minimalist design. With theme’s featured posts, you can draw attention of your audience. with the most recent posts from specially defined categories of your choosing, making for prolonged visits and increased overall traffic to your pages and articles, highlighting what you want your visitors to focus on every time. 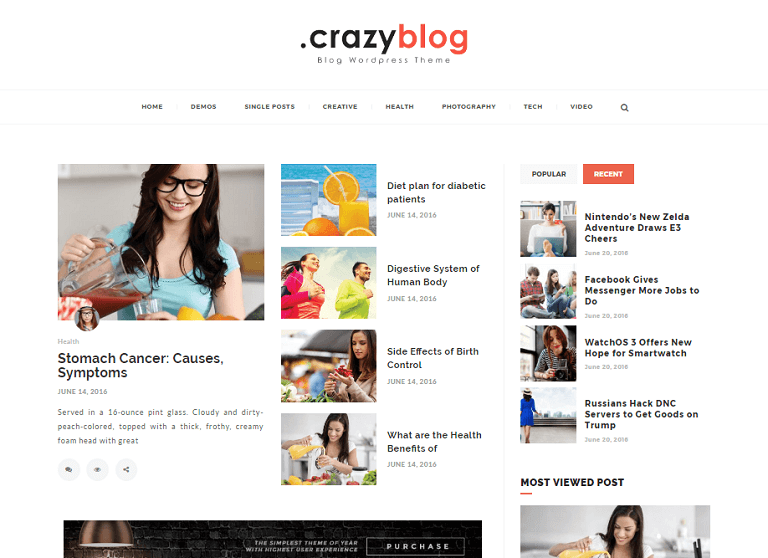 CrazyBlog is an innovative and business friendly WordPress magazine theme. It is fantastic theme for modern blogs, affiliate marketing or AdSense powered site. 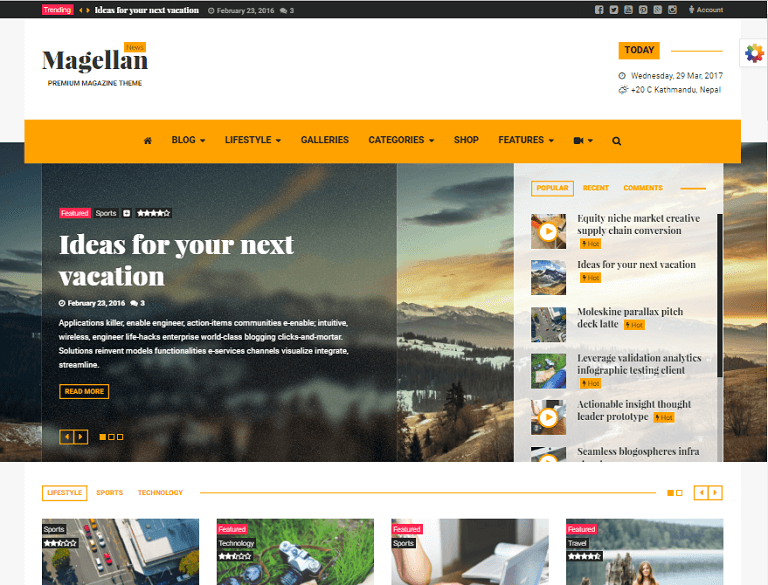 Magellan is a modern WordPress theme for magazine, news and video sharing website. The theme is made to give professional look for your online contents. 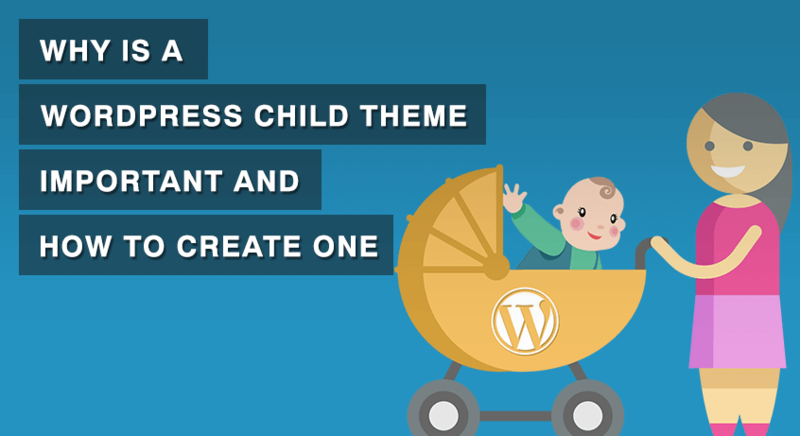 It is highly customisable so anyone can easily modify the setting of the theme to give new appearance of your site. 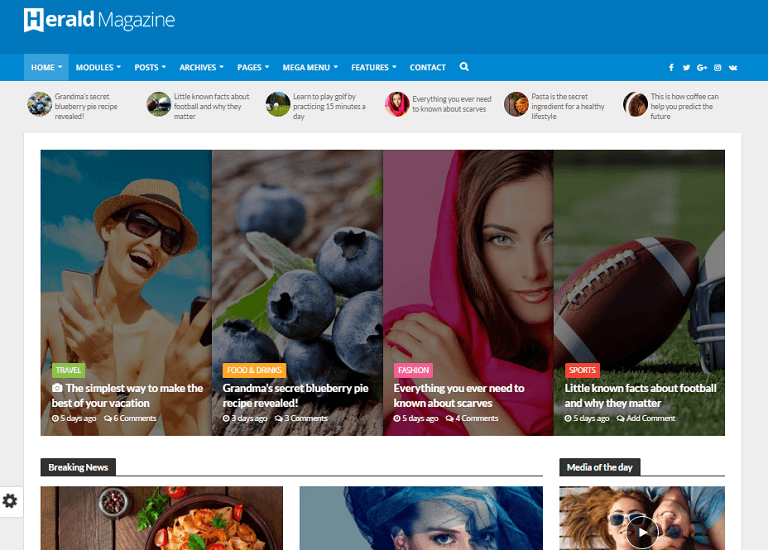 Adams is an incredibly modern and visually dynamic WordPress magazine theme. 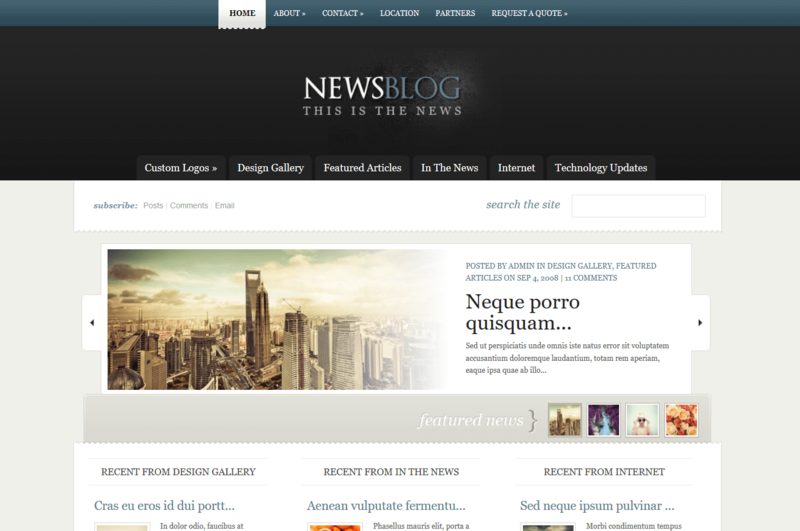 The theme is suitable for news, magazine and blog website theme. Adams is a surprisingly versatile theme, capable of handling the visual and functional requirements of a broad range of website archetypes and usages across a whole spectrum of fields and interests. 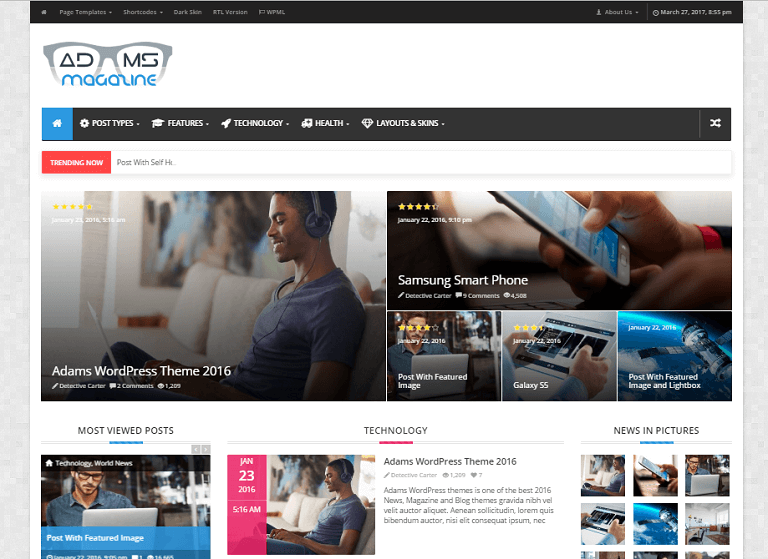 MagOne is an in·tu·i·tive and professionally created highly responsive WordPress magazine theme. The theme is suitable for news, magazine, affiliate marketers, bloggers, and online newspapers. It has lots of tools to customize site with ease. 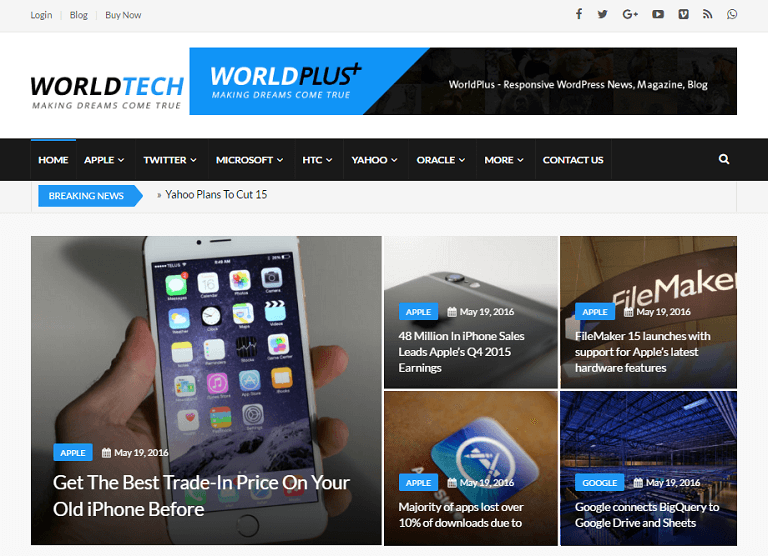 WorldPlus is a technology inspired responsive WordPress theme for news and magazine website. The theme is a powerfully crafted to give modern looks to meet the market demand. 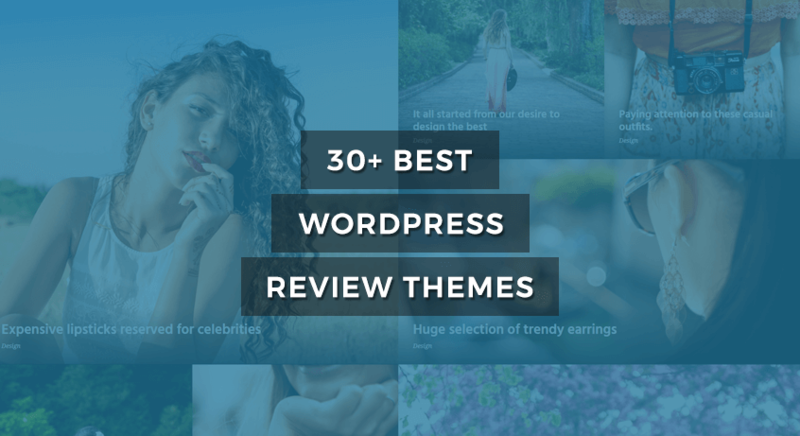 Malabar is another retina ready magazine WordPress theme. The theme powers customizable yet highly flexible modern websites. 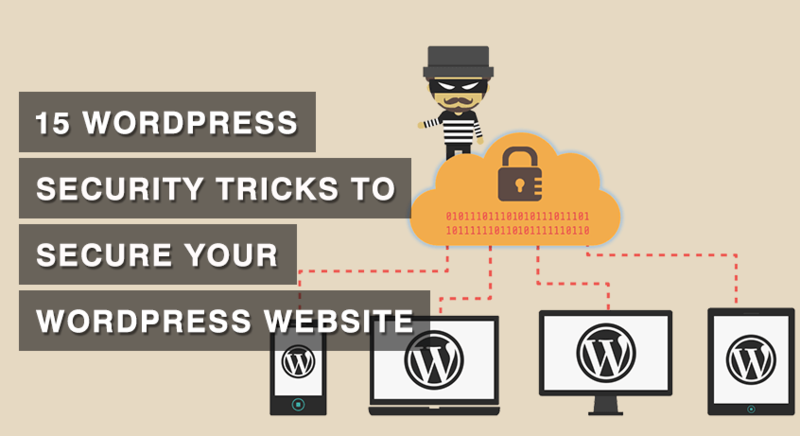 It is built on top of Boostrap framework which makes your site light and minimal. This makes your site load faster on all your devices. 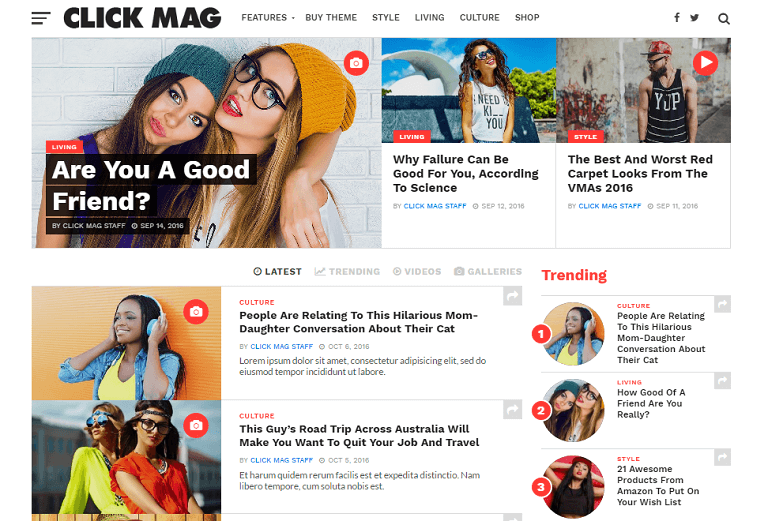 Click Mag is an outstanding WordPress theme for viral magazine and blog website. It is build on top of the fluid framework which help you create modern websites at cost of few clicks. With Click Mag, you don't need to have any prior coding experience. 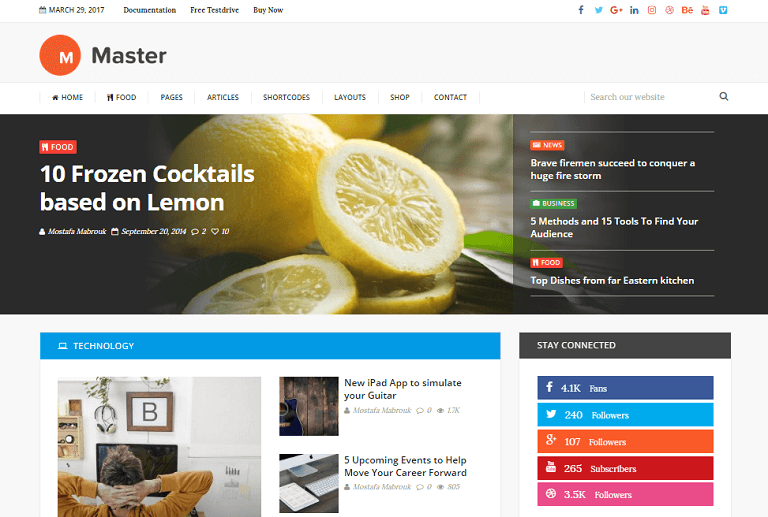 Master is yet another amazing magazine WordPress theme. The theme is well-suited for websites ranging from viral content publishers to personal magazine-style blog. 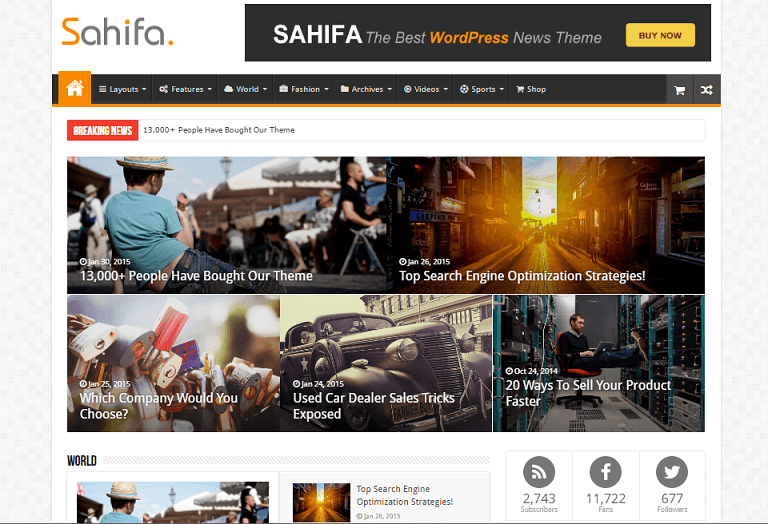 Sahifa is one of the amazing magazine WordPress theme. It comes with great features which makes your site brandable to any news/magazine site. 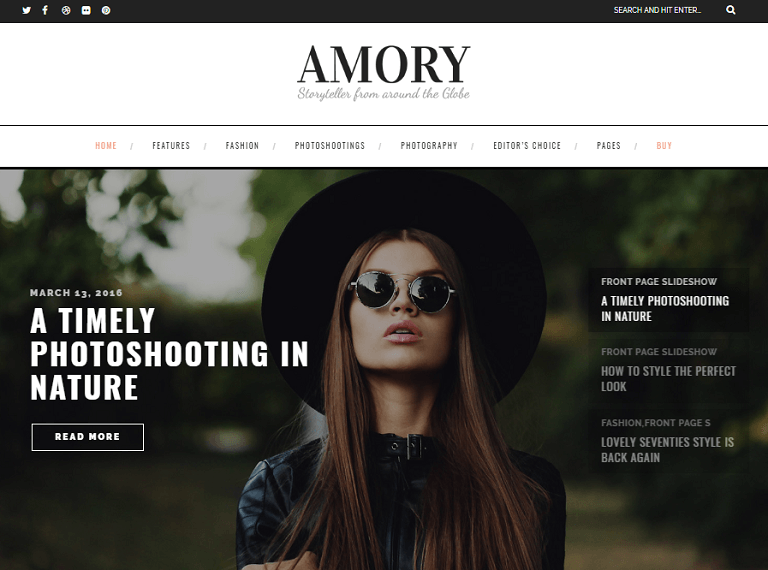 Amory is an elegant and stylish responsive magazine WordPress theme. 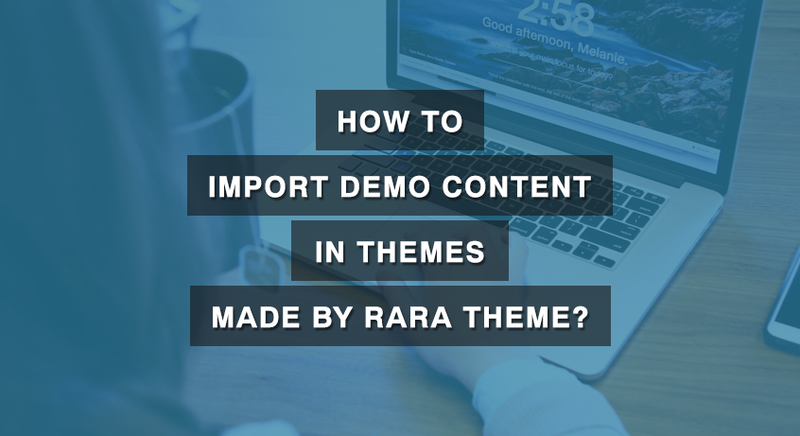 The theme ensures that your content gets attention (with good contents). Similarly, the theme is retina-ready so the images doesn't looks blurry in high definition screens. 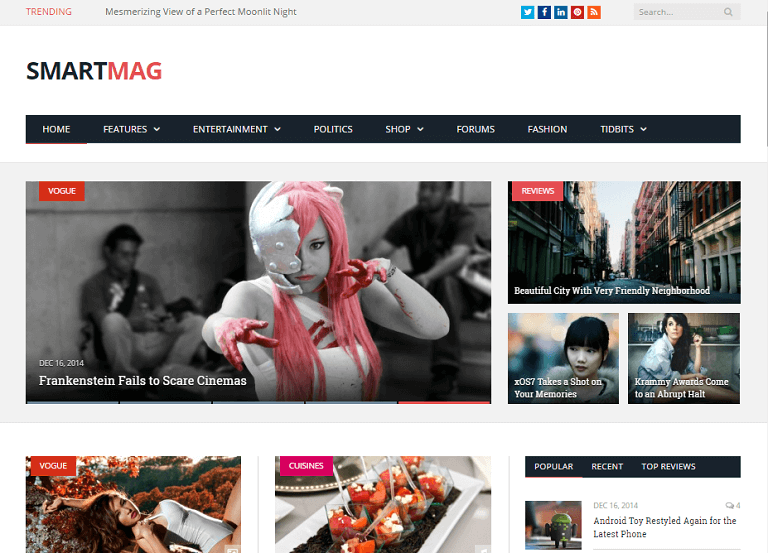 Herald is another WordPress magazine theme. The theme has a modern look and charming design. You don’t need any coding knowledge to get started with this theme. Anyone can install Herald theme. Also, the theme is speed optimized offering faster page load. 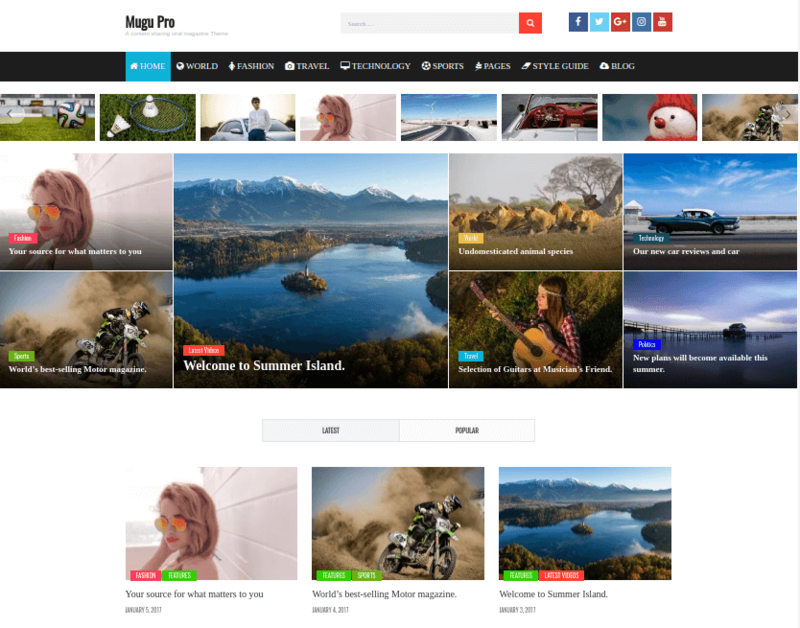 Magazine is a minimal, magazine WordPress theme. It delivers a clean and modern look to your website. Magazine brings 7 plates, 8 custom widgets that make the theme versatile. 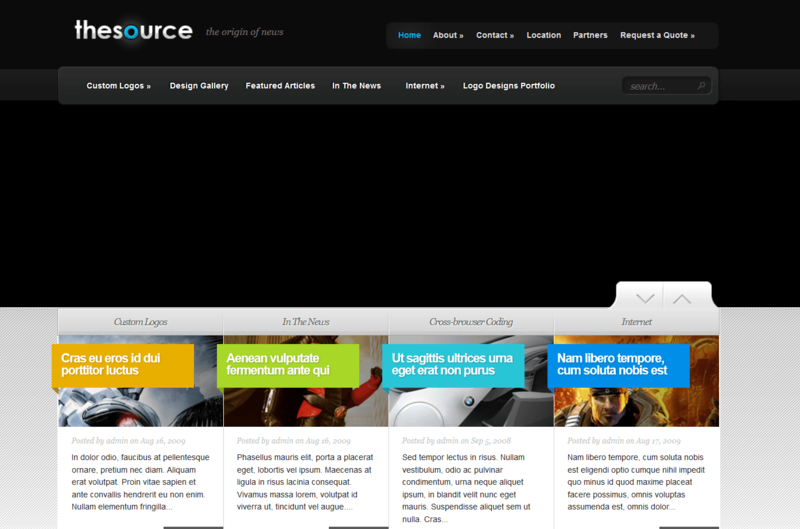 With the use of theme layout, it gives options to choose how to display content on the homepage. It's based on categories, post types, or organize as per your need. You can display advertisement (AdSense) on both desktop and mobile platform. There are lot’s features and configuration option available with Magazine theme. 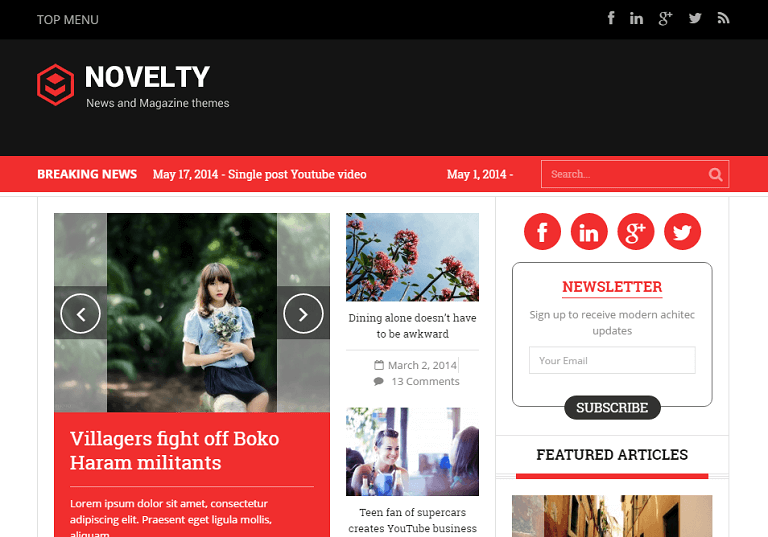 Novelty is a premium magazine WordPress. The theme is best for blog, news, content sharing website or any related category website. The theme has 12 columns grid, 5 custom widgets and 3 custom post type. You can easily create additional pages with predefined pages already created. It is comes with features like sliders, custom shortcodes and custom posts, social media integration. Similarly, it includes responsive design, ajax contact form and google maps. This theme also support WordPress Multilingual Plugin.